Highlight of this week's report is probably Shane Getkate’s performance for his Rondebosch side. Facing Cape Town CC, whose line-up currently boasts Ben Curran, of Northamptonshire (and Kevin, Sam & Tom Curran) fame. Getkate played a key role in his team’s 107-run win in the 50 over game. While we’re sure he will have been happy with his brisk 20* off 14 balls, one suspects it was his 2-12 with the ball, and particularly the wicket of Curran (12) along with the other opener Goles (4), that will give him the most satisfaction. Tyrone Kane continues his recovery from injury this weekend in Perth, batting in 2nd grade for University against Willetton. Coming in at 3, he made 7 runs. Hopefully he’ll be able to bowl a few overs next weekend, with Wolves places soon up for grabs. Also in Western Australia but in 1st grade, Stuart Thompson’s Wanneroo side played Joondalup today in the first half of a 2 day game. Thompson bowled 5 overs (0-18) as they dismissed their opponents for 201. Andy McBrine’s Midland Guildford side are also in the middle of a 2-day game in 1st grade. At the end of today’s play, McBrine had taken 3-50 in his 13 overs, as their Bayswater Morley opponents reached 320-6 after 90 overs. Over to Sydney, and Nathan Smith continues to take wickets in NSW 1st grade. This week he took 2-22 in his 19 overs as Northern Districts bowled Paramatta out for 179 , in a game that will continue next week. His bowling average is currently 17.58, but perhaps more surprisingly, his average with the bat is 38.50. Harry Tector scored another half century on Sunday, this time in the u-21 Poidevin-Gray Shield. His 53 in their game against UTS North Sydney was not quite enough on this occasion for victory, however, his Randwick Petersham losing by 13 runs. In 2nd Grade, they started a 2 day game vs Hawkesbury this weekend. Graham Kennedy played a T20 on Friday night for his Hannan’s side. Unfortunately, his 17 runs was their top score, as they crashed out for 84 runs, against a stronger North Kalgoorlie side. The victors knocked off their target in 10.3 overs without the loss of a wicket, and at 4.0, Kennedy’s 0-12 in 3 overs was comfortably the most economical effort of the 5 Hannan’s bowlers (8.0 being second best). In a 50 over A grade game today, Kennedy continued to impress in a side that needed more performances like his. Opening the bowling, he took 2-61, took 1 catch, and then batting at 4 scored 30 runs, again in a losing effort, this time against North Kalgoorlie. Ross Allen looks like he’s enjoying himself in A Grade. Batting at 3, he scored 43 runs for his Centrals club, 1 run off top scoring as his Centrals side were dismissed for 205. As we go to press, he has bowled 3 overs (0-3) in a match that will continue next week against Latrobe. Aaron Gillespie also batted at 3 in his game, contributing 6 runs to Albury’s cause against new City in Provincial 1st Grade. Cormac McLoughlin-Gavin continues to score runs in the Central Coast First Grade competition. He batted at 2 for his Lisarow-Ourimbah side, scoring 20 , the best offering from their top 3, as they lost their 1st grade game. Niall McGovern has been busy this week. On Tuesday, he scored 27(17) as opening bat for his North Eltham Wanderers side as they beat Eltham cricket club in a T20 by 8 wickets. Today, they completed their 2 day game, started last Saturday. Unfortunately, his 13 was one of only 3 in team to reach double figures, as Diamond Creek prevailed. Michael Cotter had a similarly busy week. On Tuesday he scored 8 runs for his East Keilor side as they were dismissed for 82, with their opponents Pascoe Vale Hadfield emerging comfortable winners. In their 2 day game which started today, he made 7 as his side was dismissed for 129. West Newport are currently 77-5, with the Irish wicketkeeper taking 3 scalps so far. Leah Paul got 3 runs on the board as opening bat for Ringwood in their game against Melbourne. Aditya Adey scored 2 runs for Bathurst and bowled 2 overs (0-8) in their game against the interestingly named “Rugby Union Cricket Club” last Saturday. According to the scorecard, “”Result Disputed” which may account for the lateness of its upload. 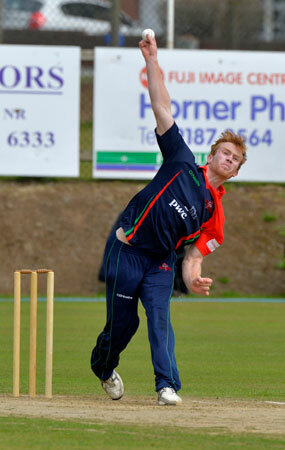 In New Zealand, more news about two young NCU players, James Metcalfe and Jonathon Waite. In their last game, Otumoetai lost by three wickets in a relatively low scoring game to Mount Maunganui. Otumoetai made 150 All Out with Waite (15) & Mecalfe (2) making more modest contributions than in their earlier games. However, brought on to bowl at the end of the Maunganui innings, Waite, had the distinction of a triple wicket maiden! The leading NCU batsman will be losing sleep already about next season! Finally, thanks for passing on news and information about players who might have been missed. If you have any information (or corrections!) please feel free to contact me on twitter (@dotski_w).